International Trailer Gives Pause for Thought: Rogue One: A Star Wars Story! An international trailer for Rogue One: A Star Wars Story has the tiniest bit of new footage and it’s food for thought. The extra beat concerns the source of the leaked information about the Empire’s new weapon and it creates a link between that source and one of the Rogue One team. Check it out after the jump. Rogue One: A Star Wars Story opens on December 16th. Teaser for the Trailer: Rogue One: A Star Wars Story! I don’t know about you, but I’m getting tired of this teaser-for-the-trailer thing – though I have to admit the teaser for the new Rogue One: A Star Wars Story trailer is genuinely intriguing. I guess they just have to be done well to work. Check it out after the jump. Rogue One: A Star Wars Story will be in theaters on December 16th. The new trailer drops tomorrow night during Olympics coverage. Celebration Reel: Star Wars: Rogue One! At Star Wars Celebration in London, Lucasfilm released a behind the scenes ‘Celebration Reel’ looking at several scenes as they’re being shot. It’s pretty impressive stuff. The Star Wars Celebration audience also got a new trailer but, sadly, it was ‘only for those in this room.’ So we’ll just have to wait on that one. The new poster (above) helps make up for that. Check out the Celebration Reel after the break. Star Wars: Rogue One opens on Decmeber 16th. Steven Spielberg finally returns to one of the genres he cut his bones on – Children’s fables/fantasy in The Big BFG. This should be a cause for celebration but somehow his stint into more serious fair has muted his childlike wonder. Or maybe it’s screenwriter’s Melissa Mathison (Screenplay) painfully, tedious, inert script that sinks this entire Roald Dahl (Novel) affair. Moments of visual splendor in service of nothing. Any film that resorts to fart jokes is creatively bankrupt. Star Wars: Episode VIII Moves; Pirates Take Original Slot! Thanks to the success of Star Wars: The Force Awakens as a Christmas release, Disney/Lucasfilm have moved Rian Johnson’s Star Wars: Episode VIII from its original May 26, 2017 release date to December 15, 2017. Pirates of the Caribbean: Dead Men Tell No Tales will now shift from its original launch date, July 7, 2017, to May 26th. Star Wars: The Force Awakens Conquers Records! Before Star Wars: The Force Awakens premiered, I bet a friend it would reach half-a-billion dollars by New Years. He didn’t think it would. We were both wrong. Globally, Episode VII passed the half-billion mark today and may well pass its first billion by New Years. How does this happen? Well, Rotten Tomatoes has it ranked 95% Fresh; Metacritic sits at 81 (Universal Acclaim) and fans scoring it at IMDb give it 8.8/10 – plus Cinemascore has it as an A. If you’re interested in numbers, there are a bunch of them following the jump – including biggest IMAX Thursday night and best IMAX global debut; biggest opening ever in 19 countries (excluding China, where it opens on January 9th), and biggest Thursday preview gross. 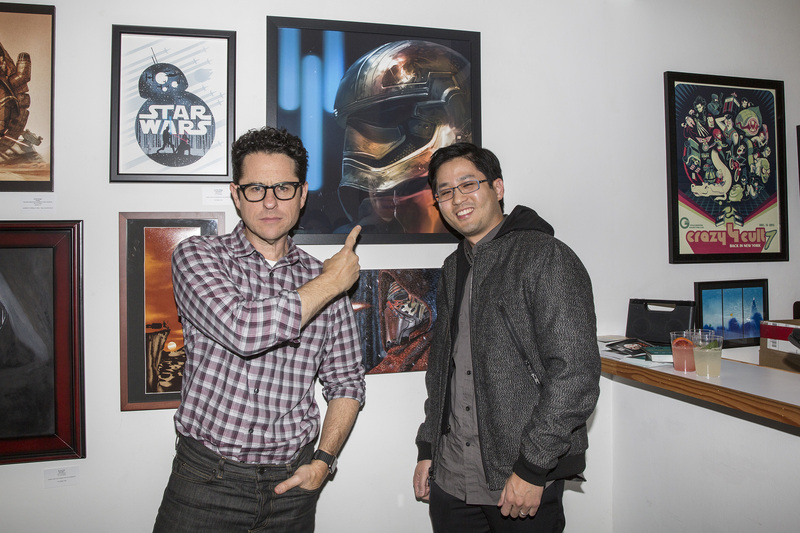 Star Wars: The Force Awakens Art Exhibit To Benefit UNICEF! From November 13-15, Gallery 1988 in Los Angeles hosted a Star Wars art exhibit featuring top professional and emerging contemporary artists. Now, the featured art pieces are being auctioned off to raise money and awareness for UNICEF. Follow the jump for details – and a look at a few of the pieces available.